Unless you live in Surrey or you really love to travel for food, you'd never know about the Guildford T&T food court. I like to call it the mini-mini version of the Crystal Mall food court, except with a less-frustrating parking lot. Inside, you'll find a location of Ba Le, 2 Chinese food stands, a Korean stall and a wonton noodle joint. Since Mrs. Spray Bottle was under the weather, I promised to get some take out and bring her back a steamy bowl of wonton soup. 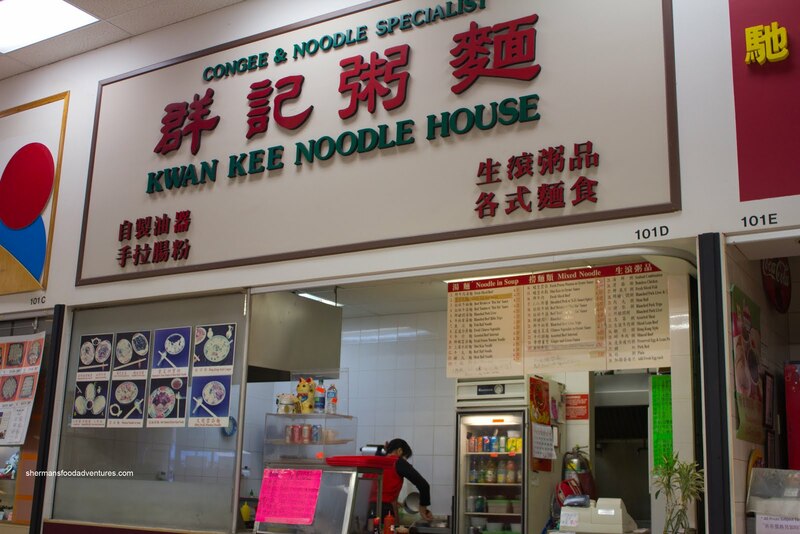 And yes, I made my way out to Kwan Kee Noodle House which is within the T&T food court. The place is pretty much a one-man (actually it is a one-woman) show. So patience is nee ded while one waits for the food to be prepared. I decided to get a little of everything to sample their wares. As mentioned, I got a bowl of Wonton Soup for Mrs. Spray Bottle. 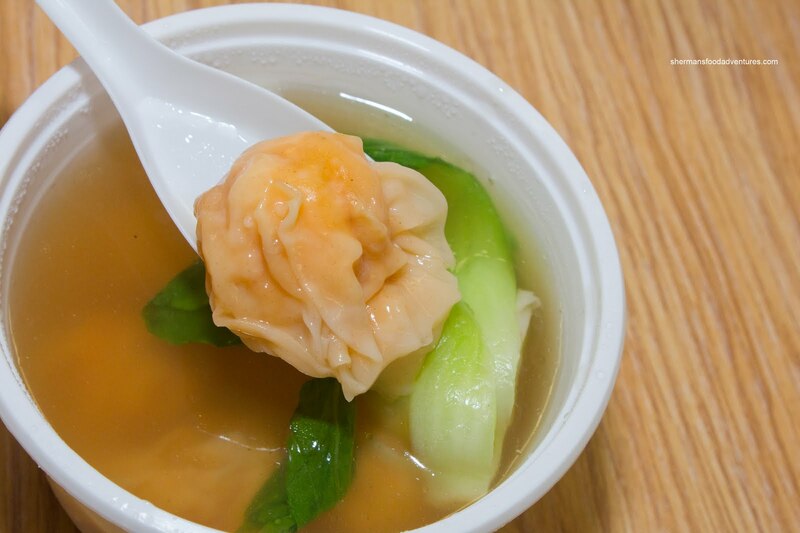 Unlike many wontons found in the burbs, these were comprised of shrimp only. They did look a little weird in colour and slightly strange in texture too. However, they were not bad since the shrimp filling had the proper snap texture. They were on the smaller side though. The broth was quite light while not being bland either. For myself, I went for the Sui Gau Noodles in soup (to be a little bit different than wontons). 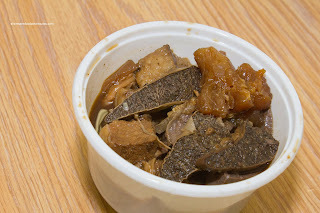 In actuality, the sui gau were pretty much the same as the wontons except being slightly bigger and with the addition of wood ear mushrooms. Hence, they exhibited the same qualities as the wontons with the added snap of the mushrooms. 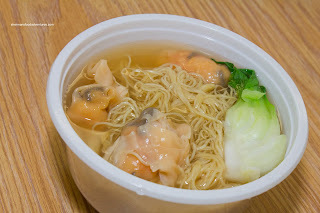 The wonton noodles were cooked al dente with a pleasant chewiness. I also got the Assorted Offal as a side and honestly, I was a bit taken aback at the portion size. Not a whole lot for almost $8.00. Furthermore, it wasn't rea lly all that good either. I found the tripe to be woefully overcooked, practically melting into nothingness. On the positive side, the spleen, lung and brisket were good (mmm... spleen...). Yet, the one thing that left a bad taste in my mouth (literally) was the sourness of the braising liquid. Not pleasant. 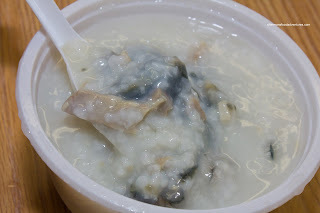 Lastly, I had a bowl of Preserved Egg and Salted Pork Congee. Now this was pretty good. The congee base was thick and remained thick until the last spoonful. It was only lightly seasoned and did not reek of MSG. There was plenty of preserved egg and pork, which made the congee hearty. The pork had a nice texture, yet it c ould've been saltier. I dunno. Is it just me? Maybe I'm just getting pickier. People swear by this place and in all honesty, the food was not bad for a food stall. However, some things could be better and I couldn't get over how awful the offal was (sorry for the pun). However, the place serves a purpose and the rest of the stuff is reasonably-priced and more than edible.